A former Florida “Mr. 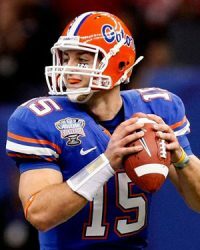 Football” and All-State selection at Nease High School, Tim Tebow played for the University of Florida from 2006-09 where he led the Gators to two national championships and became the first sophomore in NCAA history to win the Heisman Trophy. Tebow would end up accounting for 145 career touchdowns at Florida, earning All-America honors three times, earning two Maxwell Awards as the nation’s outstanding player and earning SEC Player of the Year as both a junior and senior. A first round draft pick of the Denver Broncos, Tebow would lead the Broncos to an 8-6 record and the playoffs in 2011. In addition to his football career, Tim also played professional baseball and is well-known for his philanthropic work.